Raritan Valley Community College (RVCC) in Branchburg graduate Jo-Ann M. Petruzziello is the recipient of the Baker and Rannells Paralegal Studies Student Graduate Award. Petruzziello, a resident of Warren, was presented with the honor at RVCC’s Academic Awards Ceremony, held May 13 at the College’s Branchburg Campus. The award was established by Baker and Rannells, PA, a Raritan-based law firm that specializes in intellectual property, trademark and copyright law. “The firm has hired a number of RVCC graduates from the Paralegal Studies program and has benefited from the good education that the College provides. 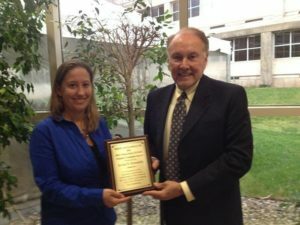 The award is our way of thanking RVCC,” said Nielsen, who presented the $500 prize to Petruzziello at the May ceremony. Petruzziello was previously employed as a 911 dispatcher in Bridgewater Township and is currently the Deputy Zoning Officer in Branchburg Township. She earned a 3.91 grade point average out of a possible 4.0 in the Paralegal Studies Certificate program and is a member of the Phi Theta Kappa Honor Society. For additional information about the program, contact Maria M. DeFilippis, Esq., Coordinator of Paralegal Studies at RVCC, 908-526-1200, ext. 8239 or Maria.DeFilippis@raritanval.edu. Raritan Valley Community College’s main campus is at 118 Lamington Road. For further information, visit www.raritanval.edu.